As I reflect on the day, one of the elements that stands out for me is the way that the locations we visited appealed to our different senses, especially sound. My ongoing research examines music during the First World War so I think that I am especially attuned to what we are hearing, in addition to what we see and touch throughout the tour. A consideration of the sounds of war and memory offers a unique lens through which we can view the different locations we visited today. Our first stop was Lijssenthoek Military Cemetery, the largest hospital cemetery of the Flanders region in Belgium. Inside the visitor’s centre a blank red “listening” wall encloses an exhibit about the cemetery. Along the wall are symbols of an ear which, when pressed, play short audio recordings of letters and war diaries to detail the experiences of the individual soldier. In order to hear the recording you must place your ear quite close to the wall, creating an intimate sense of being directly spoken to by the soldiers. I thought this interactive part of the exhibit was unique as it allowed you to focus solely on hearing the voices in the wall, without reading any accompanying write-ups or examining photographs. The individual experience was at the forefront of this aspect of the exhibit. Our final stop of the morning was at Essex Farm Cemetery where we saw a monument commemorating the composition of the poem “In Flanders Fields” by Lieutenant Colonel John McCrae. The recitation of this poem has become a significant part of Remembrance Day ceremonies across Canada, and is also a well known war poem outside of our country. In many ways, McCrae’s words and the messages he expressed shape how we commemorate the war today, particularly through the symbol of the red poppy to honour the memory of soldiers. Although we did not read this poem aloud today, I found that for the rest of the day I had the melody for the song “In Flanders Field” replaying in my head. I thought more about this song adaptation and how it demonstrates the popularity of McCrae’s poem at the time the song was composed in 1917, particularly with the home front audience at which it was directed. Following lunch, we toured the In Flanders Fields museum located in the Cloth Hall in Ypres. Our group discussed the distinct message of the museum that emphasized the destruction of war at the hands of imperialists. The dark walls, jagged exhibit dividers, and the projection of coloured lights in shades of red and green all contributed to an ominous feeling throughout. However, it was not just the visuals that allowed the museum to portray its messages but the sounds also had a role to play. There was a continuous recording of an organ playing throughout the exhibit. The constant, drawn out notes became so much a part of the overall experience for me that I almost forgot about the music after awhile, until it stopped suddenly. That was when I realized how important the sounds were to setting the mood within the museum. The highlight of the day for me, and perhaps the most aural experience, was attending the ceremony at the Menin Gate. Music has continued to play a significant role in commemorative ceremonies over the years – from pipe and brass bands to buglers. There are certain constants with the music, for example the playing of the Last Post (as we heard tonight) contributing to a sense of unity and conformity across many of the nations that fought in the war. 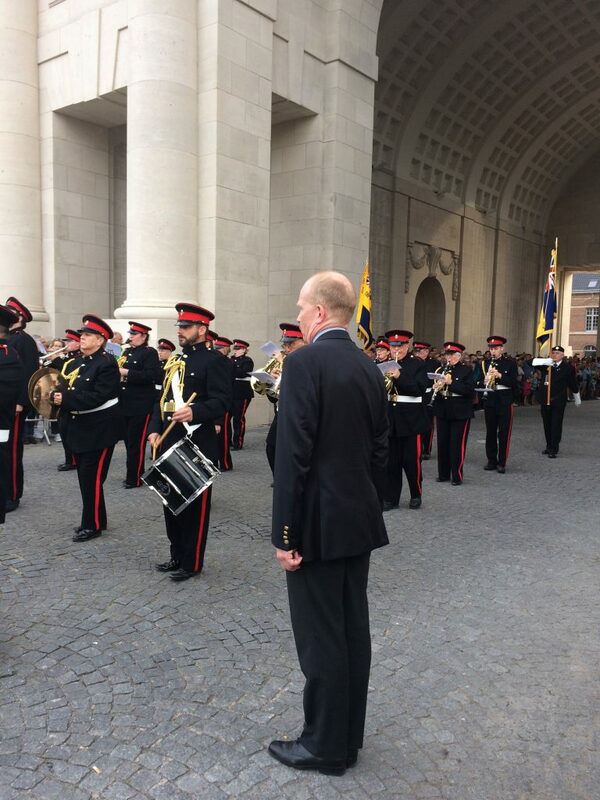 Music evokes the emotions, and that was certainly the case for me as I listened to the buglers and band play while viewing the thousands of names of those killed during the war inscribed on the walls. As we continue along the tour I will continue to reflect upon the sounds presented to us in different forms, and how they contribute towards the constructed memory of the war.